BERTHOUD: When searching a fromagerie for the perfect chunk of cheddar or parmesan, cheese aficionados have probably never grilled vendors over what kind of music was played to their cheeses. When searching a fromagerie for the perfect chunk of cheddar or parmesan, cheese aficionados have probably never grilled vendors over what kind of music was played to their cheeses. To many, the question itself might sound crackers. But a Swiss cheesemaker has embarked on an experiment to test the impact of music on Emmental, one of the most famous cheeses in Switzerland, even if it prompts pundits to write such grating remarks as: you gouda brie kidding! Marching through his 19th century cellar in Burgdorf, a town also known as Berthoud, on the edge of the Emmental region in central Switzerland, Beat Wampfler shows off hundreds of perfectly formed circles of the holey classic maturing in neat rows. A veterinarian by day but consumate apron-wearing cheese enthusiast at night, Wampfler’s love for Emmental has aged well over the years like the finest stock he cultivates. 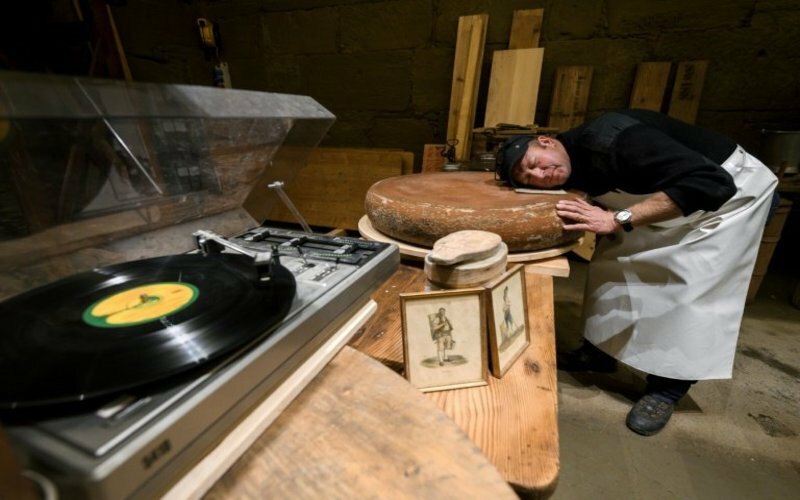 In one corner of his impeccably clean cellar, nine open wooden crates sit with wheels of Emmental inside and small music speakers directly below. Since September, the cheeses have each been blasted with sonic masterpieces from the likes of rock gods Led Zeppelin to hip hop legends A Tribe Called Quest. The project — “Sonic cheese: experience between sound and gastronomy” — hopes to show that the power of music can influence the development, characteristics and even flavour of the cheese. “Bacteria is responsible for the formation of the taste of cheese, with the enzymes that influence its maturity. I am convinced that humidity, temperature or nutrients are not the only things that influence taste,” Wampfler told AFP. “Sounds, ultrasounds or music can also have physical effects,” he insisted. The thought of playing rock ‘n’ roll music to influence the flavour of cheese may make some scientists cringe. But parts of the scientific community have spent years analysing the effect of sound on plants, and some mums-to-be believe playing classical music to their unborn child makes them smarter. Music can create feelings, reaching inside people and stirring their senses into a fondue of emotions, in ways that can make people smile, cry or jump in elation. Is potentially testing whether Roquefort is a fan of hard rock or Queso a follower of flamenco really so completely far-fetched? The University of the Arts in Bern does not think so and is helping Wampfler conduct the experiment. With Wampfler’s refined cheeses, the pungent sounds played to them also include techno beats, ambient choirs and Mozart’s classic Magic Flute. “At first we were a bit scared,” laughed programme director Christian Pauli. For now, the Emmentals age alongside their respective music genres, maturing their potent flavours in potentially alternative sonic-induced ways, awaiting tasting in the new year. “Will the cheese taste better? It’s hard to say,” Wampfler said. A jury of expert cheese tasters will assess whether there is a hole in this Swiss cheese experiment on March 14.